It may be only one website, but there are a lot of pieces that make up that one website. You’ll need login info for FTP, your admin account for the content management system, yadda yadda yadda. Multiply all that by a half dozen websites, and it’s information overload. DomainBrain has a place for everything - your FTP login, database access info, CMS admin account, plus hosting and registrar account info. All in one place, just a click away. And now with customizable categories and fields in version 2, you can fill in whatever’s missing. DomainBrain is free for use to manage your first domain. Download it and give it a try. Like it? Purchase a license. DomainBrain 2 is a paid upgrade for registered users of version 1 - purchase a discounted upgrade license here. 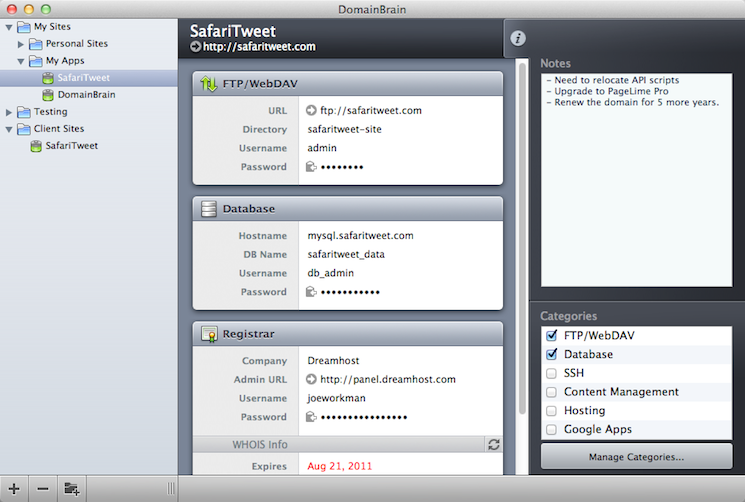 DomainBrain's main window sports a simple, straightforward interface. Add your own custom categories and fields. Table categories are perfect for lists of data. Customizable Data Categories - Add or delete multiple instances of a category or create your own custom categories and fields. Show/Hide Categories -	Display or hide categories on a per-domain basis. 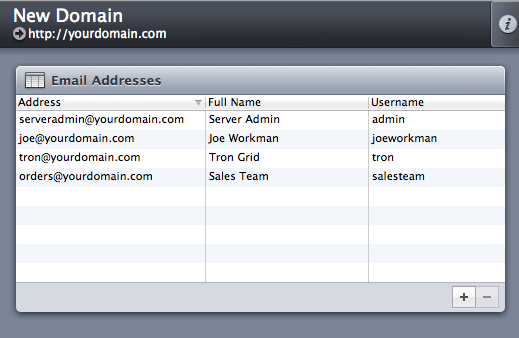 Table Categories - A new category type for tabular data such as email address lists. 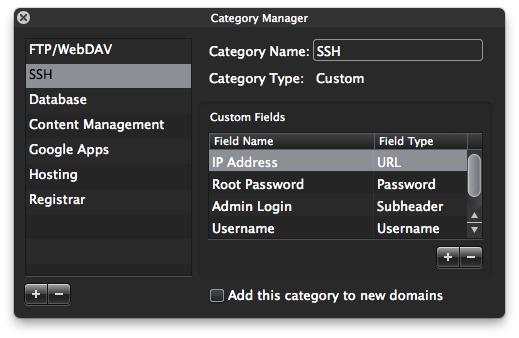 iCal Integration - Set reminders for domain expiry dates in iCal. Optional password protection - Password protect all your data with AES encryption for extra security. Nested folders - Organize your domain library in whatever way makes sense for you.